In the early stages of his interpretation of the panto classic, director Guy Masterson risks losing dramatic momentum when it takes too long for characters to reappear (Fairy Goode, for example) or to even properly share the same scene (Cinderella and the Ugly Sisters). 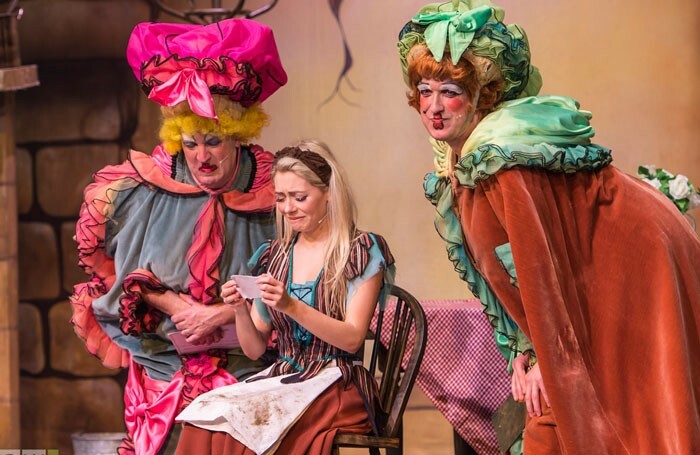 Even when gruesome twosome Welwynia (Michael Totton) and Gardenia (Nicholas Collett, also the show’s writer), finally start bossing Cinders about, they are a bit too nice to her – hence the lack of booing from an audience desperate to join in. However, these reservations become less of an issue as the evening progresses. There is welcome sparkle and magic about Lauren Rammell’s transformation into Princess Ella (orchestrated by Laura Wickham’s apprentice fairy), as well as her first meeting with Paul Rich as Prince Charming. The smitten lovers create some charming romantic chemistry at the ball (credit throughout to choreographer Helen Crosse). There are some odd decisions here and there, a lot of the music chosen – Spice Girls, Michael Buble – has little resonance with the children present – and Ronnie Toms’ Del Boy-influenced Baron Hardup, however good, must also leave them feeling non-plussed. That is not to say that any of the performances lack conviction. Collett and Totton’s lip sync battle is great fun, as is Rich’s Proclaimers number with Curtis Brown as Dandini, while Hayden Wood’s ever-jolly Buttons never lets his energy dip.